Containerized cargo volumes at the Port of Long Beach fell for the second straight month in August when compared with the same month a year ago, as an increase in loaded outbound shipments was not enough to offset declines in volumes of loaded inbound and empty containers. 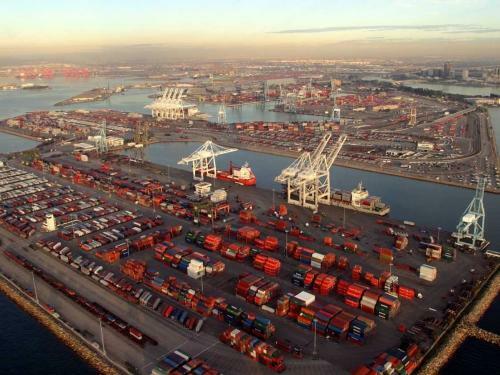 Long Beach terminals saw container handling volumes slip 1.9 percent year-over-year to 679,543 TEUs for the month after falling 4.4 percent in July, according to the latest data from the port authority. Throughput of loaded import containers fell 3.6 percent to 343,029 TEUs in August, while loaded exports grew 1.9 percent to 119,546 TEUs and empty container volumes slipped 1.1 percent to 216,968 TEUs. The two-month decline followed several months of consecutive year-over-year gains, bringing total throughput in the first eight months of the calendar to 5.32 million TEUs, a 9.4 percent increase from the same 2017 period. Port of Long Beach Executive Director Mario Cordero attributed the recent decrease in volumes primarily to a shift in vessel deployment and port calls by the major east-west container carrier alliances, but also warned that the escalating tariff battle between the United States and China has helped boost volumes early in the year and could have the reverse effect going forward. The port also noted the decline came against an August 2017 comparison, which was at the time the third-busiest month for cargo in the port’s 107-year history. So far during the port’s 2018 fiscal year, which began Oct. 1, 2017, total volumes have grown 11.8 percent to just under 7.3 million TEUs compared with the same fiscal 2017 period, including 3.69 million TEUs of loaded inbound containers, up 10.7 percent year-over-year; 1.44 million TEUs of loaded outbound boxes, up 8.8 percent; and 2.17 million TEUs of empties, up 16 percent.